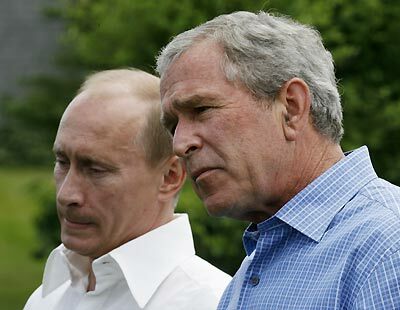 U.S. President George W. Bush (R) and Russia's President Vladimir Putin hold a joint press availability after their summit meeting at the Bush family home on Walker's Point in Kennebunkport, Maine July 2, 2007. Bush on Monday had informal talks with Putin over issues of anti-missile defense system and the disputed Iran nuclear program. The U.S. defense attache in Cyprus who went missing with his car since last Thursday was officially confirmed dead on Monday by the U.S. embassy in the country. One of the men involved in the failed car attack at Glasgow Airport was an Iraqi doctor trained in Baghdad, Sky News reported on Monday afternoon. Iran, Venezuela hail close ties against U.S.
Iranian President hailed the brotherhood between his country and Venezuela on Monday, pledging the two nations would resist against "bullying and expansionist powers", which clearly referred to the United States. The Palestinian infighting has left the Palestinians with two governments - Abbas's new cabinet in the West Bank, and the Hamas rulers in Gaza. Leaders from the Group of Eight (G8) leading industrial powers kicked off their annual summit in Heiligendamm Germany on June 7, 2007. The UN Security Council unanimously adopted Resolution 1747 that urges Iran to suspend uranium enrichment work "without further delay." Israel bombed targets in Lebanon after Hezbollah militants' killing of three Israeli soldiers. Five years has passed since the 9/11 terror attack on the United States. The 4th round of six-party talks on the Korean Peninsular nuclear issue is scheduled to open on July 26 in Beijing. The 2004 US presidential election is set to smash all spending records according to a study. Yasser Arafat -- hero of Palestinian national struggle -- has passed away.